Hi, I am interested in your 2011 Chevrolet Camaro SS Coupe (stock #19GKM52) listed on Autotrader for $44,900. I'd like to get more information about this vehicle and confirm its availability. (Please note: If you happen to be viewing this vehicle on a website other than our main website, its possible that only some of our many photographs of this car are presented due to website limitations. To be sure you access all the photographs, please go to our main website: Garage Kept Motors.) 2011 Chevrolet (Berger) SS Camaro - Prescribed Power, One Owner Since the 60s Berger Chevrolet has been customizing Chevys much like Yenko, Dana, Baldwin Chevy, or Nickey were at the time. Berger began selling Prescribed Power packages from their showroom right here in Grand Rapids, Michigan to add a bit more kick to Chevrolet Performance cars. Made in limited numbers, the Berger cars are desirable among muscle car enthusiasts. If you know what a Berger Camaro is, then you get it. Garage Kept Motors is pleased to present this limited edition 2011 Berger Camaro SS for consideration. You are looking at the first car produced in a special run of only 25 cars for 2011. This Berger Camaro SS has more to offer than first meets the eye. 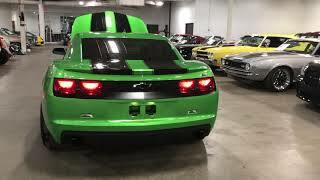 You cant miss the finish: rare and awesome Synergy Green metallic paint. Painted black SS stripes have been added, along with an SS Big Block matte paint section on the tail panel to give a nod to past generations of Camaros. As expected, the interior of the car has modern Camaro SS comforts leather sport seats, XM Radio, Heads Up Display, Bluetooth Capability, park assist, and 4 center console gauges. The car has just a hair over 28k original miles and has been taken care of by one proud woman owner. Documentation of everything from oil changes, original window sticker, and promotional framed posters come with the car. Under the hood we find a 6.2L Supercharged V8 that pushes out 550 horsepower, while a Hurst short throw shifter handles gear selection. A Berger chambered stainless exhaust system flows, and sounds better than the factory system...oh the sounds that V8 makes! Berger also gave some attention to the suspension to take it up a notch. Upgrades include new progressive rate springs, urethane rear subframe bushings, rear anti-sway bar, and some eye-catching, 3-piece lightweight Forgeline forged aluminum wheels. Sticky GoodYear Eagle F1 tires help transfer the V8s power to the pavement. This is a Camaro to consider if you like unique vehicles with interesting history. Being just one of 25 produced with these specs, you certainly dont see these everyday! The strut towers also signed by the Berger family and the General Manager in 2011. This car has been meticulously maintained and has been fully serviced before listing, ready for a new garage to call home. Be sure to check out all the photos and video on our main website: Garage Kept Motors. Call if interested or e-mail with any questions. Thank you for looking.